A couple of years ago, Dean (Scooter) Vrooman, who would be one of the first inductees into a WHL Hall of Fame if their was such an animal, did the research into the WHL and seven- and nine-game playoff series. I have updated it to include the first round of this season’s playoffs. From 2004 through 2011, the road team was 10-10 in Game 7s. Overall, in 80 deciding games in series that went the distance (7 or 9 games) in league history, the home team is 59-21. Meanwhile, Hartley Miller, who worked on the Prince George Cougars’ radio crew this season, provided some information now that the first round of the WHL playoffs is over. He points out that the first round featured 44 games with the home-road split right down the middle — 22-22. There were two Game 7s, with the home team going 1-1. In six of the eight series, the home team went .500. The exceptions? In the series between the Lethbridge Hurricanes and Red Deer Rebels, the home team was 5-2; in the matchup between the Moose Jaw Warriors and Swift Current Broncos, the home team was 2-5. G Connor Ingram of the Kamloops Blazers has signed a three-year entry-level contract with the Tampa Bay Lightning, which selected him in the third round of the NHL’s 2016 draft. Ingram is on his way to join the Syracuse Crunch, the Lightning’s AHL affiliate. . . . Ingram was 2-4, 2.18, .946 in a just-completed first-round series against the Kelowna Rockets. Tampa Bay GM Steve Yzerman was in Kamloops for Game 4. That night, Ingram stopped 48 shots in a 1-0 loss to the Rockets. . . . In three seasons with the Blazers, Ingram is 81-50-18, 2.68, .918. . . . He turned 20 on March 31, so next season will be eligible to play in anywhere in Tampa Bay’s organization or in the WHL as a 20-year-old. The Portland Winterhawks have signed D Ryan Miley, who is from Brookings, S.D. He played this season with the Sioux Falls Stampede U16 AAA team, putting up 39 points, including 14 goals, in 50 games. Miley, who will turn 17 on July 12, is an undrafted list player, who was in Portland’s training camp prior to this season. F Tyler Robertson, who played three-plus seasons with the Edmonton Oil Kings, has committed to attend NAIT and play for the Ooks next season. Robertson, from Sherwood Park, Alta., was part of the 2014 Memorial Cup-championship Oil Kings team. . . . Robertson, who will turn 21 on Oct. 1, had 87 points, including 40 goals, in 235 regular-season games with the Oil Kings. With the Regina Pats and Swift Current Broncos preparing to begin a second-round WHL playoff series on Thursday, Rob Vanstone of the Regina Leader-Post takes a look at the franchise that really is a miracle on the Saskatchewan prairie. That piece is right here. Mike Fraser, the wandering and writing scout, is back with another solid piece. This week, he takes a look at a terrific underdog story from the Alberta Midget Hockey League, and also bemoans the fact that there won’t be a Pacific regional midget AAA series this month. That piece, from the Westman Journal, is right here. The Sioux City Musketeers wrapped up the Anderson Cup as the USHL’s regular-season champions on Sunday with a 4-1 victory over the visiting Tri-City Storm. With three games remaining, the Musketeers, who also won the Western Conference title, were at 40-10-7 and had won seven in a row. Jay Varady, the Musketeers’ head coach, spent seven seasons (2003-10) in the WHL on the coaching staff of the Everett Silvertips. He is in his fourth season with the Musketeers. Mark LeRose, in his third season as Sioux City’s general manager, was an assistant in Everett for three seasons (2007-09, 2013-14). . . . The USHL playoffs begin next week. In the OHL on Tuesday night, the host London Knights beat the Windsor Spitfires, 3-2, in Game 7 of that first-round series. The Knights are the defending Memorial Cup champions, while the Spitfires are in this year’s tournament as the host team. . . . In another OHL Game 7, the host Kingston Frontenacs scored a 3-2 OT victory over the Hamilton Bulldogs. . . . In the OHL’s second round, the Knights face the Erie Otters, the Frontenacs go against the Peterborough Petes, the Owen Sound Attack plays the Soo Greyhounds, and the Oshawa Generals meet the Mississauga Steelheads. There was one Game 7 in the QMJHL’s first round, with the Cape Breton Screaming Eagles scoring a 5-4 OT victory over the Gatineau Olympiques on Tuesday night. . . . In the second round, the Screaming Eagles will face the Charlottetown Islanders, the Acadie-Bathurst Titan go against the Blainville-Boisbriand Armada, the Val-d’Or Foreurs play the Saint John Sea Dogs, and the Chicoutimi Sagueneens face the Rouyn-Noranda Huskies. Hat Tigers in a second-round series. They will open with games in Medicine Hat on Friday and Saturday nights. . . . The Hurricanes and Tigers haven’t met in the playoffs since 1991. Back then, the 14-team WHL featured two divisions and the Hurricanes beat the Tigers in seven games in the division final. The Spokane Chiefs then swept the Hurricanes from the championship final. . . . Last night, the Hurricanes, who hadn’t won a series since 2009, opened a 2-0 lead on first-period PP goals just 1:03 apart. . . . D Brennan Menell scored at 7:21, the first of two goals the home team would score with a 5-on-3 advantage. . . . F Giorgio Estephan (2) made it 2-0 at 8:24. . . . F Lane Zablocki (6) scored for Red Deer at 19:08, but Lethbridge got that one back just 22 seconds later when F Ryan Vandervlis counted. . . . Vandervlis enjoyed a four-point outing. . . . The Hurricanes got some insurance from F Jordy Bellerive (2), who scored while shorthanded at 9:29 of the second period. . . . F Brandon Hagel (7) got the Rebels to within two goals at 2:31 of third period, but the Hurricanes put it away with two more PP goals. . . . Vandervlis scored his fourth goal of the series at 8:18 and Menell got his third goal at 10:33. . . . 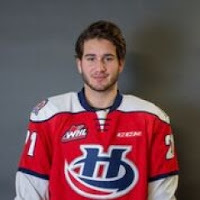 The Hurricanes got two assists from each of F Tyler Wong, F Zak Zborosky, Vandervlis and Estephan, with Bellerive and Menell each getting one. . . . Vandervlis, an 18-year-old from Red Deer, finished the series with four goals and three assists. In the regular season, he had 25 points, including eight goals, in 60 games. . . . G Stuart Skinner recorded the victory with 31 saves. . . . Red Deer starter Riley Lamb gave up four goals on 19 shots in 29:29. Lasse Petersen came on to finish up, allowing two goals on 12 shots in 30:31. . . . Lethbridge was 4-6 on the PP; Red Deer was 0-3. . . . The Rebels were without F Evan Polei, who had nine points, including three goals, in the first six games. He was serving a WHL suspension after taking a headshot major and game misconduct in Game 6. . . . Lethbridge F Tanner Nagel, the subject of that hit, didn’t finish Game 6. But he was cleared to play and was in the lineup for Game 7. . . . Announced attendance: 5,244.